"The New Age of Comics"
Q: What are Comic Ebooks? A: Comic Ebooks are comic books in ebook or electronic format. Q: Why Comic Ebooks? Why not traditional webcomics? Collectibility will become increasingly important again. Remember when collecting comics was fun? You don't have to be connected to the internet to read them. Have a laptop? Take them with you! Readers can download Comic Ebooks and save them to disk. Who knows, maybe one day you'll read them from your mobile phone! Possibility of printability. Some people like to be able to hold something in their hands when they read. This function would allow readers to print out your own comic book from your own printer. Don't have to worry about subscriptions. You can download Comic Ebooks at your leisure, not just when one is sent to you. You have the choice of what you want to read. Download one, or download them all! Q: Do I need any particular software to read the comics on my computer? A: Yes. Singed Tentacle Comics will release Comic Ebooks in common ebook formats at first. Currently, Comic Ebooks are available in Adobe Reader format. Software is currently under development specially created for viewing Comic Ebooks. Q: What forms of payment does Singed Tentacle Comics accept? A: Currently, Paypal is the preferred form of payment. PayPal is accepted worldwide, and information about your bank accounts or credit cards are not provided to Singed Tentacle Comics. Q: How much do Comic Ebooks cost? 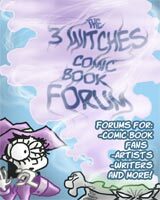 A: Most of the comics will have a preview Comic Ebook available for free. If you don't want to buy one, just get the previews. The cover price for a full Comic Ebook will be less than the cover price of a print comic. Q: What have I been waiting for? I have to get some Comic Ebooks, pronto! A: You got it, bub! Start right here!